Canon's EF Cinema Prime Lens, the CN-E 14mm T3.1 L F, offers superior 4K-image quality and a full-frame image circle with an outstanding wide-angle field of view. 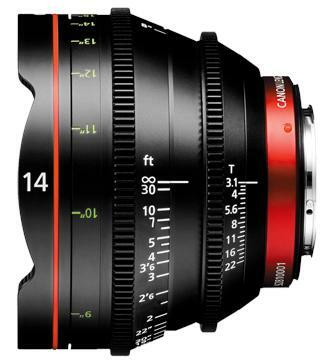 Optimized for motion picture production, it is one of the newest entries to the Canon Cinema Primes series of lenses, which offer the same consistent design and form factor, focus gear position, lens coatings and uniform 114 mm front diameter throughout the set. Engineered with the demanding professional in mind, the CN-E 14mm T3.1, shoots incredible wide-angle images with minimal edge distortion and will produce sharp, high-resolution pictures with consistent color balance, contrast, and clarity.